Hard Naak Life: Life and Death are in the Power of the Tongue. Are you Speaking Life? Thank you so much for your gentle reminder of the power of the tongue. 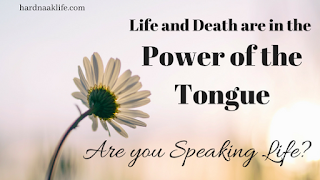 I have recently experienced just how powerful and hurtful the tongue can be and have been prompted to begin a study on the tongue. Your blog has been the kick-start. Keep moving forward!